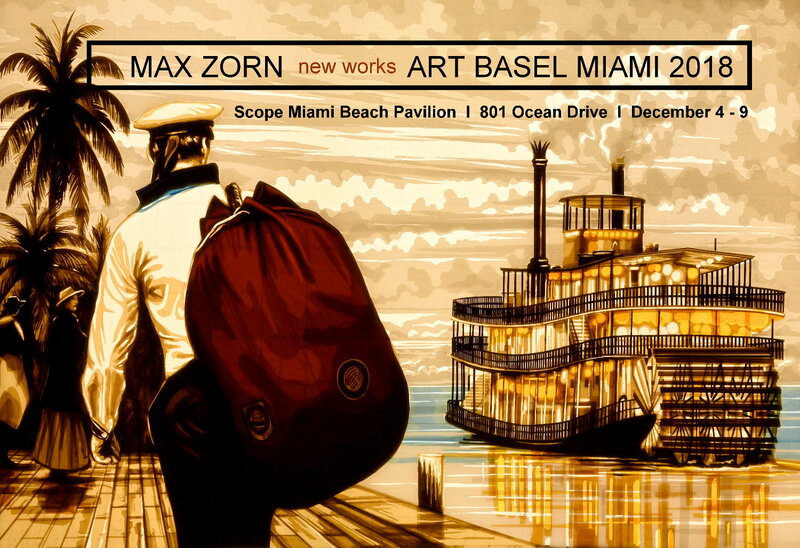 Art Basel Miami – Scope Miami Beach Booth B33 (USA), together with Stick Together Gallery. Dec. 4th – 9th. 801 Ocean Drive, Miami Beach. 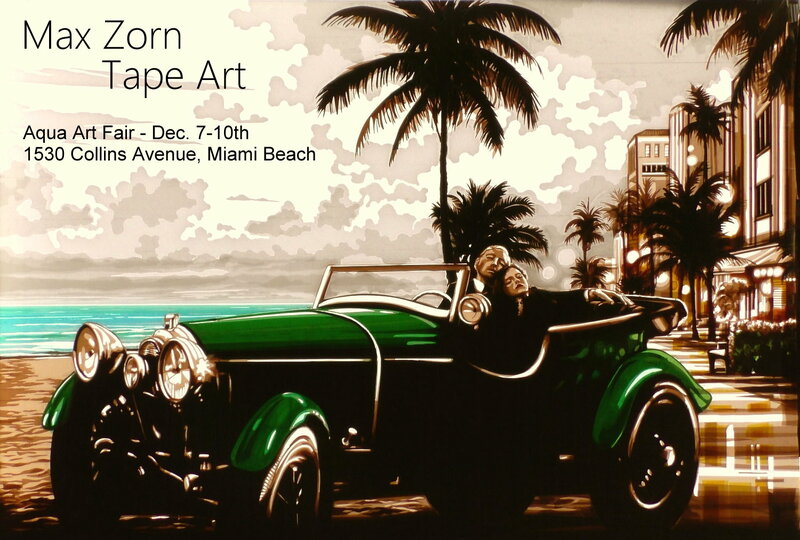 After 5 consecutive years of exciting art and sold-out shows during Art Basel Miami we were heading back to South Beach to exhibit with “Scope Miami Beach”. The 18th edition of SCOPE Miami Beach returned to Ocean Drive and 8th Street in its bespoke pavilion on the sand. SCOPE Miami Beach features 140 International Exhibitors from 25 countries and 60 cities, and welcomes 60,000 visitors over the course of 6 days. – Kunst und Anti-Diskriminierung – mit Kunsthandel Bamberger. Heidelberg (Germany). Mittelbadgasse 7, 69117 Heidelberg. May 25th – June 5th. – Max Zorn – Tapeart – 26. April at the Frank Gehry towers in Duesseldorf (Germany). With Rhein Asset Management. Neuer Zollhof 3, 40221 Duesseldorf. – Art Basel Miami – Aqua Art fair (USA) together with Stick Together Gallery. 1530 Collins Avenue, Miami Beach, FL 33139. Dec. 7 – 10th. – Moniker Art Fair – London (UK). The Old Truman Brewery, London. 5 – 8 October. For free VIP tickets get in touch via info@maxzorn.com. – Moniker Art Fair (London, UK). October 6th – 9th. London Art Week. Old Trueman Brewery, Brick Lane, London. – Tape Art Convention (Berlin, Germany).October 10th – November 5th. Neurotitan Galerie, Berlin. – International Art Fair Zurich (Switzerland). September 29th – October 2nd. Kongresshaus Zürich. – Art and Architecture Vol. 1“ am Tag des offenen Denkmals (Krefeld, Germany), September 2016. Mies van der Rohe Business Park. – StreetArtFest Grenoble (France) – June 8th – 26th, Spacejunk Grenoble, with Anthony Lister, Augustine Kofie, C215 and many more. – KSL 2016 (Dinslaken) – June 17th – 18th. each 12.oo – 18.oo h.
– KUNSTabend „Von Contemporary bis Urban Art” (Munich) – Opening Thursday 2.06.2016, 7.oo – 10.oo pm., at Tresor Vinum. – Stroke Artfair (Munich), with Urban Art Now (booth A10) and MUCA (house 3) – May 4th – 8th, Praterinsel.